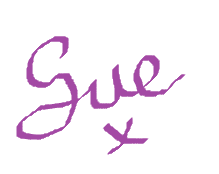 My name is Roswitha, and Sue has kindly invited me to fill a guest spot on her wonderful blog. Quite exciting this: I’ve never done anything like this before. I am totally new to the blogosphere – as an active participant that is; obviously I do read blogs that interest me (who doesn’t?) - so thank you Sue! 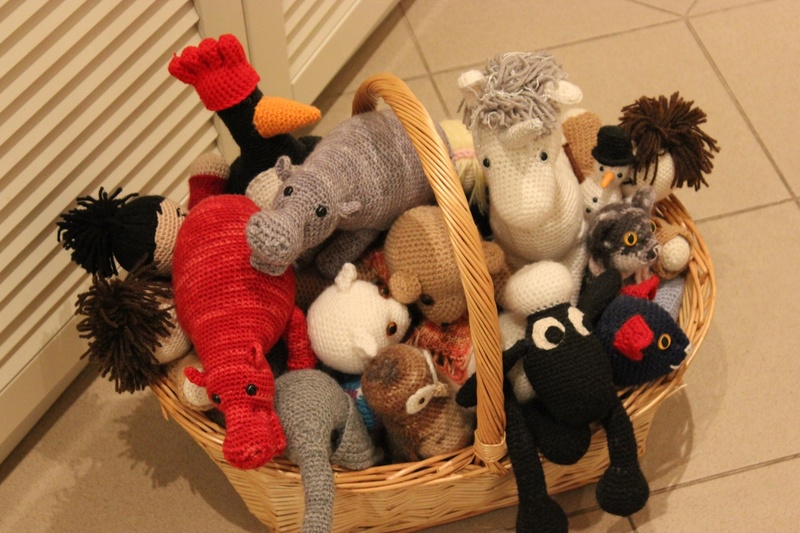 So, designing crocheted animals is what I do – not as many as I’d like, because of RL, which is not crocheting or knitting (or any of the millions of other things I find myself fascinated with), unfortunately. For a while now I have been experimenting with a different kind of design. These are tiny ornamental miniatures, made of only a few very simple parts – usually a kind of egg shape for the body, and a smaller egg or a sphere for the head; maybe a simple shape for a wing, if it is a bird. 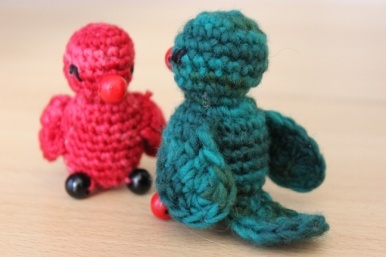 Plus some wooden beads, a bit of pipe cleaner (both of which can be had in many different colours) and a bit of fiber-fill – and that is pretty much it. It is quite fascinating to try and do as many different animals as possible with this concept. Not all animals work: I tried this for a sloth (I had imagined this might look quite nice, hanging upside down from a branch. But the result was rather boring – so I’ve canned this for now. Maybe I’ll try again, at a later date). But with others, it works surprisingly well! The patterns, so far, are mostly unpublished (there is one, a little reindeer, in the crochet calendar http://www.knittingpatternaday.com/ for next year, and I have submitted a few more for the following calendar); I hope, however, to trot them out over the next few months. And add to them, hopefully, after that. 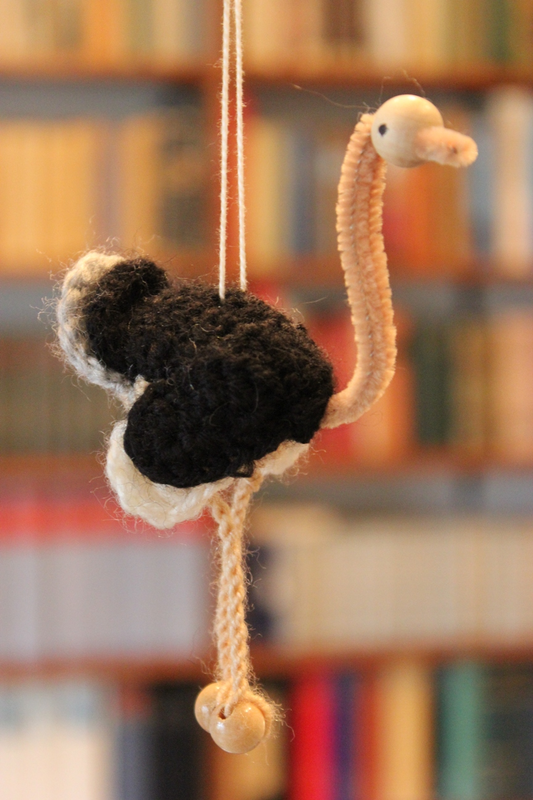 So far I have: a sheep, a hedgehog, a dog, a cockerel, a blackbird, a lion, a parrot, a little undefined bird, a zebra, an ape, an ostrich, a flamingo. And some more which need to be checked and maybe modified a little, so I’d rather not announce them before they are finished. So here is a little teaser – exclusively for this blog: my little sheep. Note: I usually use US notation for my patterns. I have changed this, however, to UK notation for this blog (as this is a UK based blog, I thought I‘d better adapt). Body, head and head cap are all done in a spiral. 11) 6x (dec, dc) = 12 st. Stuff. 12) 6x dec = 6 st. Finish off. 9) 6x dec = 6 st. Finish off. Sew head to body (see photo). 3) dc = 9 st. Finish off. With black yarn 6 ch, fold in half and sew to head. Thread two pieces of black yarn through bead, twist tightly to form a cord with the bead on one end; fasten end and sew to body. Make 4 of the same length. Join white yarn at backside of animal (slightly higher than the middle), 4 ch, finish off. 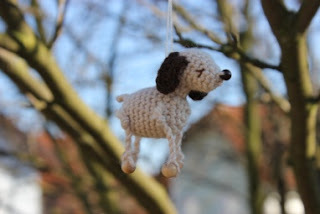 Add the thread to the back of the animal so the body is horizontal when hanging from it. NOTE! 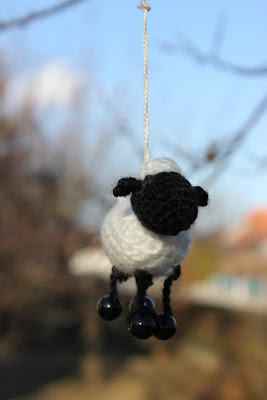 These animals have the right shape only when hanging from a piece of thread, therefore take care to add the thread at the right place! Getting the materials: it seems that sometimes wooden beads can be difficult to find. 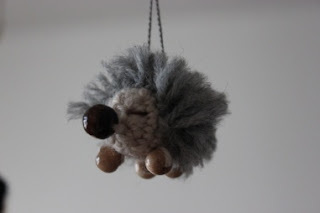 There are, however, online shops selling them (etsy has quite a few of them). If you can’t find them in the right colour, buy untreated beads and paint them with acrylic colour. This works quite well. I also cover them with thin clear nail varnish (yes, really!) to give them a bit of a sheen. Pipe cleaner is available in many different colours; so far I’ve always found the colours I needed locally (but again, etsy has quite a few shops selling them). So enjoy! And tell me if you like them and if I should do some more! Thank you ever so much Roswitha . Wow thank you ever so much for sharing you sheep pattern! It is just soooo cute! Please check them out, I love her Hippo it's fantastic! They are so cute. I'm going to research and find out the difference in the crochet stitches from yours to US so I can try it. Keep up the good work. Thank you very much - I am glad you like it. Not that much of a difference for this pattern anyway: just dc (UK) = sc (US), that's all. These are too cute!! They would be cute on the Christmas tree!! Thanks for sharing! Thank you all I am very happy that you like them. 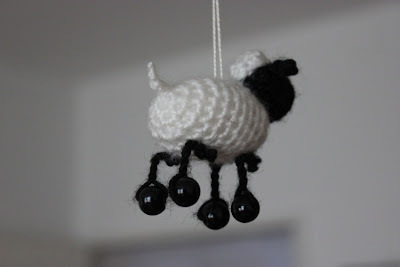 I always have some kind of mobile for children in mind; but yes, they could well be used for a christmes tree. Thank you all for your wonderful comments. They have all been forwarded to Roswitha.